Hey all! 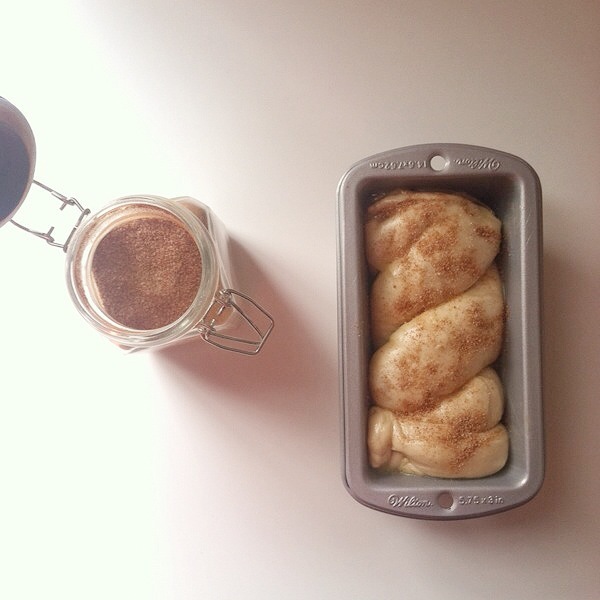 It’s been a while since I had a bread recipe and as usual it’s not your average bread recipe. 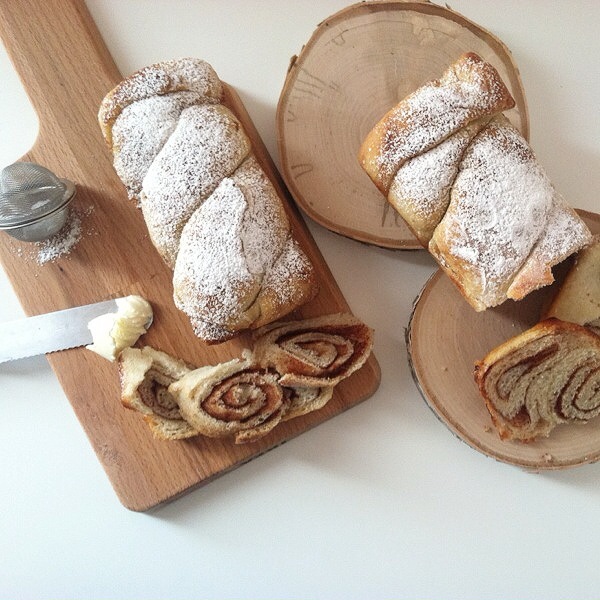 I really like cinnamon rolls, one of the few sweets I rarely turn down and I wanted to try and do a Cinnamon Bread. I know for a fact it’s been done before because I’ve seen it at supermarkets but I wanted to try and make it at home and it was AWESOME! 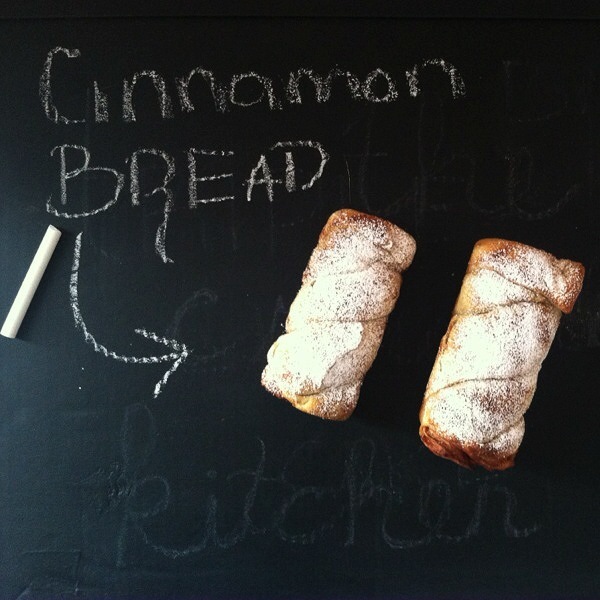 Behind the Scenes (BTS): Like I stated above the reason I wanted to try to create this recipe was because I love cinnamon rolls and wanted to make a less sweet homemade cinnamon bread. I’ve had this bread recipe for years and for the longest time I couldn’t find it. When I was cleaning out some storage in my room I found it and all hail DE-CLUTTERING! This is a very basic bread recipe but it ain’t basic. I love that this recipe doesn’t contain sugar so it’s not very sweet, I feel like the yeast in bread already gives it a certain type of sweetness so sugar in the bread recipe is a no-go. When I was recipe testing another recipe I had leftover dough and decided to try this out since I had been thinking about it for a while and it was on my to-do list anyway. It turned out great and I made it again. Alterations: If you want to try other things than cinnamon, orange would be a great alteration. I think orange is a very underused dominate flavor and it’s a fruit that always reminds me of being a kid for some reason. You could spread orange jam on it instead of butter and sprinkle some orange sugar (orange zest and granulated sugar) over it. About 1/4 c. should do. This could really be done with any citrus fruit. If your going to use a berry I would suggest a under-ripe berry and not putting any jam in it. A light sprinkle of sugar wouldn’t hurt either. You could also add some chocolate chips to this recipe. I would say maybe 1/2 c.
Helpful Hints & Suggestions: When it comes to kneading dough it can be tricky for people who haven’t done it before or if it’s been a while. Whenever I describe kneading to someone I tell them it’s like a deep tissue massage for the dough. 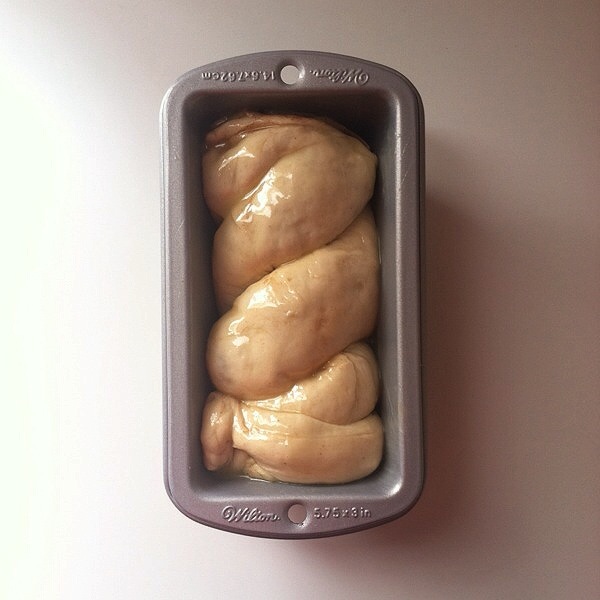 You push your palm and wrist into the dough tightly and with your fingers grab up the dough and do it again. You want to make sure this happens to the whole dough and not just a single portion. If your wondering what kneading the dough even does then you have to know about the flour. Flour has gluten and the gluten makes the dough elastic and pull back when you stretch it; kneading the dough and letting it rest calms down the gluten and makes it easier to move and shape. This is why kneading and resting the dough is important, also so the yeast can do it’s job and make the dough double in size and become airy or you’ll be eating a hard brick. Some other important information I would give you is in the rolling and twisting. 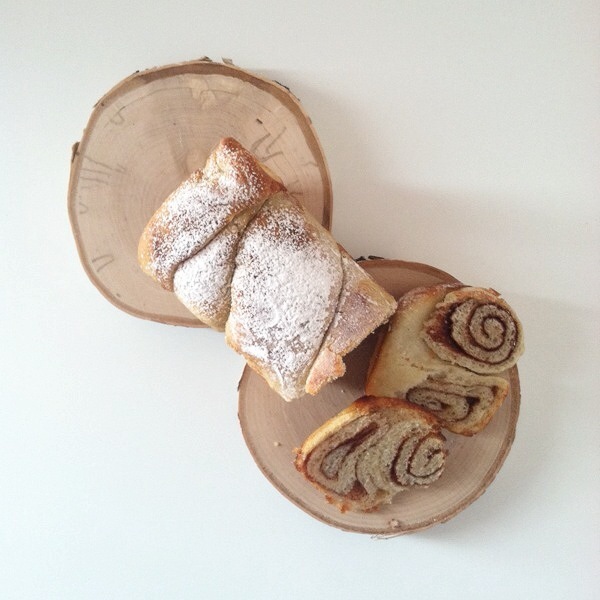 It’s so easy to say roll it like a cinnamon roll until it’s time to do it. The first couple of rolls won’t be as tight as you want them to be but the bigger your roll gets the more you want to tuck it in tighter. It’s like when your packing a bag for a long trip and you want to get as many clothes in the suitcase. You take your shirts and pants and roll them, the closer you get to the center the tighter you roll your clothes. When it’s time for twisting it really helps to pinch your two ends together tightly. You want to pinch it so tightly that the dough attached and stays together no matter what. You can twist it as slowly as necessary but you want the twist to be tight. Since you butter the logs it helps the twist stay together anyway. Another way to try the twist is to start from the middle. The middle is the thickest part usually and easiest to deal with so if starting from the middle works for you then start from the middle, go downwards and pinch those ends together and then go back to the middle, finish twisting to the other end and pinch those ends together. As long as the ends are pinched tightly you won’t have much worries. Storage: This bread is like any other bread it can’t be out for too long or it will get stale, You can put it in a zippy bag and try and get as much air as possible out or you can get one of those plastic bags that you weight fruit in at the supermarket, tie the end and it will look like a real bread loaf or you can put it in Tupperware. As long as it’s not out getting constant air and becoming stale your good for the bread to stay fresh for about a week or two max. Topping: I purposely kept the topping simple. Because I didn’t want it overly sweet. 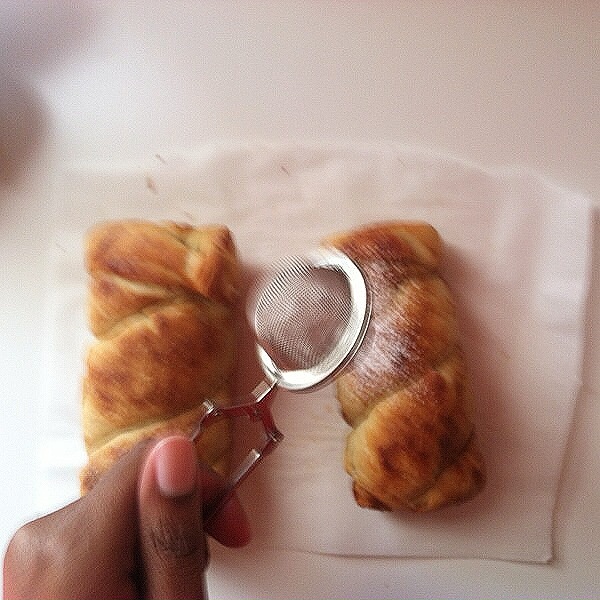 A little dust of powdered sugar was enough for me. 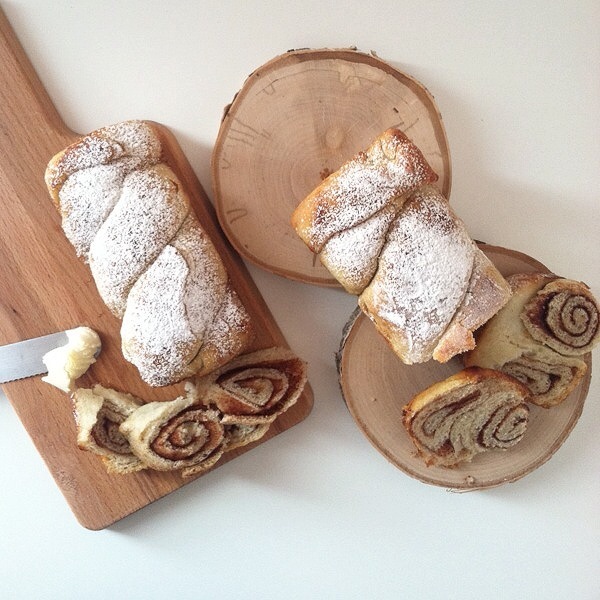 Below in the directions portion of the recipe is a glaze adjustment if you want it like a cinnamon roll. 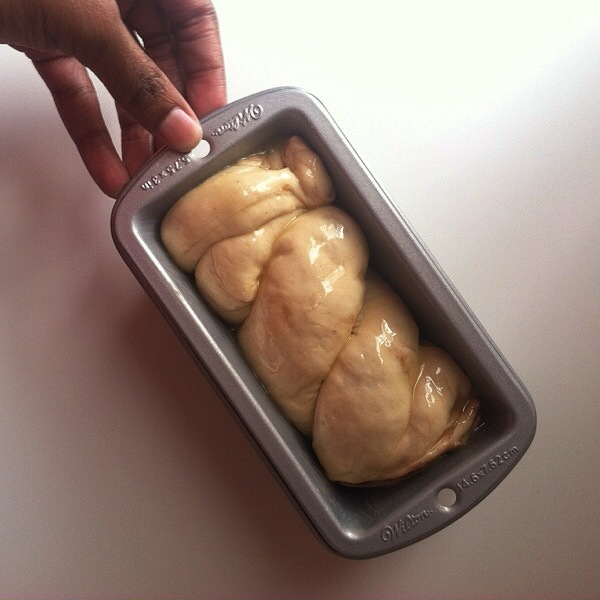 The glaze will harden and you will still be able to cut it like regular bread. Cutting: You need a sharp knife to cut this. NO if, ands, or buts. 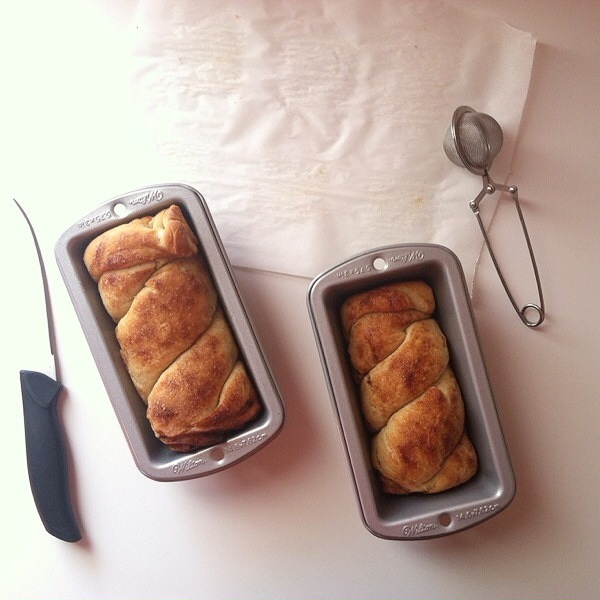 Ta-Ta-For-Now: Well it’s that portion of the blog where I stop writing your ear off and let you see the recipe. I hope you all enjoy this recipe and don’t be scared to try one of the alterations. I know I will one day soon. They sound way too good not to try. BYE! Dough: Pre-measure out all of your ingredients and sift your flour 2 times. Dissolve your yeast into your warm water (Warning: the water should be warm NOT hot, this will kill the yeast and your bread won’t rise. Make sure when you touch the water it’s warm like a baby’s bath). When the yeast has soften, about 30 second to a minute, add your melted butter, salt and stir the wet mixture, add to your flour and make sure all the yeast is in the flour, it has tendencies to fall to the bottom of your wet mixture. With a wooden spoon stir your flour and wet mixture until it is almost fully combined and hard to manage, turn your dough onto a flour surface and let it rest for about 5 minutes. This is long enough to wash and dry your bowl to return your knead dough to. After the dough has rested start to knead the dough for 5 minutes. It will be smoother in looks and elastic. Dough Part II: Return your dough to your bowl (make sure the bowl is greased with butter or oil) and cover it with a damp towel, not soaked, and let it to rest and rise for 90 minutes, this will give the dough ample time to double in size. Dough Part III: Once the dough has risen punch the dough, cut the dough in half and with a rolling pin roll the dough on a floured surface again into a square-ish; it doesn’t really matter since you’re going to roll it up and it will all end up fine. You want it about a 1/2 inch thick. (Hint: Make sure your lift your dough and flour underneath repeatedly to make sure it’s not sticking to your surface). 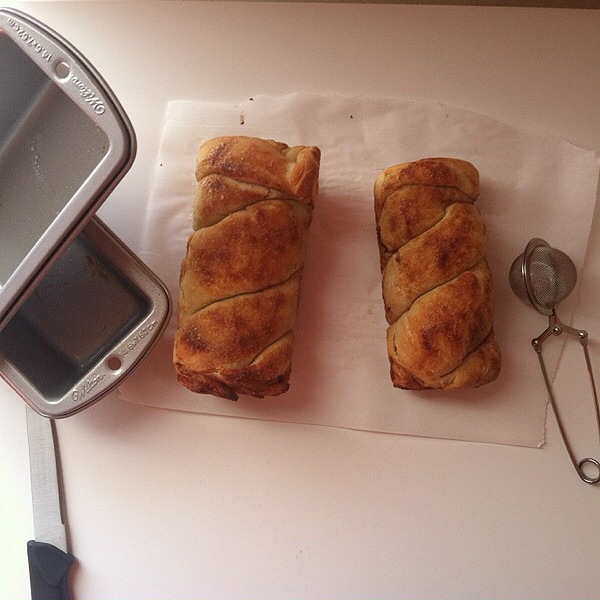 Cook Time: Once your cinnamon twist are fully twisted put them into your greased loaf pans, this should make two to three loafs. Set it aside in a warm dry place with a damp, NOT WET, towel over it so it can proof for about 1 hour. (If you’re in a rush you can let it proof for 30 minutes.) 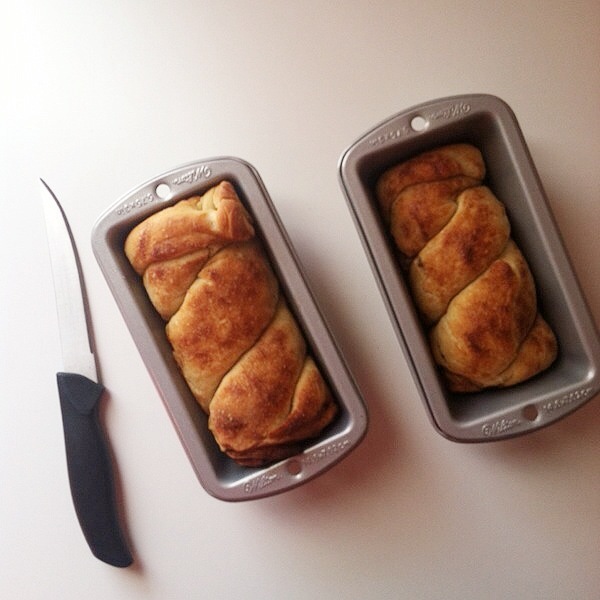 Once your bread has proofed brush some melted butter over the loaf and sprinkle some cinnamon sugar over it. Put it in a 375F oven for 35 – 50 minutes. Check after 30. 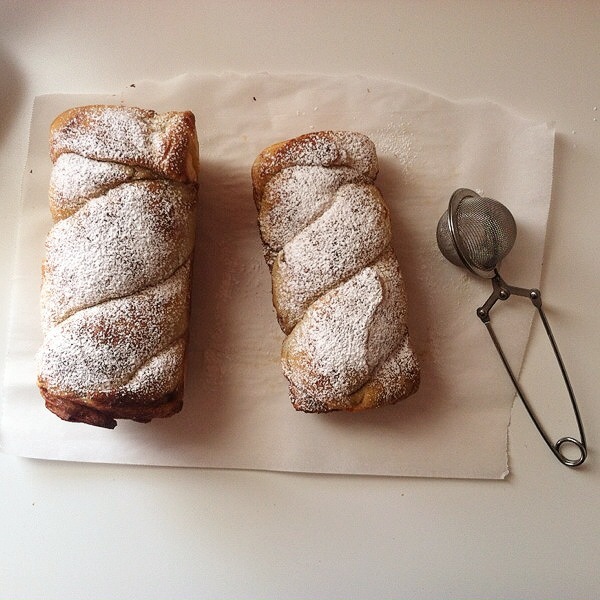 Eat & Enjoy: Once your bread is done let it cool down and dust some powdered sugar over it. If you want to glaze the bread then use 1/3 c. powdered sugar and 1 tbsp. of milk and stir until fully mixed and the powdered sugar has melted. (P.S. Make sure you have a sharp serrated knife to cut through the bread. There is a lot of sugar and butter in this recipe so it tends to caramelize and can become hard to cut if you have a dull dinner knife.